Before we get down to the homework, let me remind you that this week is our extra activity! We are going to meet this Saturday January 26th at 12:00 at the exhibit space at Logroño city hall to discuss a fantastic photography exhibit by Victor Lorza. You are welcome to bring along a friend or family member if they would like to speak English with us! This week we talked about gender roles and changing ideas of masculinity and femininity. To warm up, try testing your vocabulary about masculine and feminine with this exercise or checking out the infographic men vs. women. For reading, check out one of the relevant articles at Breaking News English, such as Most Divorces Due to Household Chores and Men Hurt More in Rocky Relationships. For listening, try one of Elllo's listening exercises about being a man or being a woman. For "original version" listening, try watching this TED talk, Gender Inequality: Our Century's Greatest Injustice (available with subtitles in English and in Spanish). For writing, please respond to one of the following questions: Do you think parents have different expectations for daughters or for sons? What would it be like to change genders for a day? This week there is original version cinema. On Sunday January 27th at 19:30 they are showing The Deep Blue Sea at the Breton Theater. I imagine that by this point you are making progress on your new year's resolutions. Keep up the good work! This week we did some more role-playing to practice tactful and polite expressions in various situations: giving suggestions, giving and responding to bad news and politely saying no. Now, let’s take a look at the homework. For listening, check out ESLPod's Episode about Giving Bad News and Condolences or this exercise about Delivering Bad News. For reading, why not take a look at this article about how to give suggestions in English or a more advanced break down and text Making Suggestions. Try taking this quiz to see if you know how to say yes or no politely in differention situations. Last, but not least, the writing. Please write a short dialogue between two people where one person must politely decline an offer to go out with a firned. Mark your calendars, next week will be our extra activity for this month. We will visit the Victor Lorza photography exhibit at city hall on Saturday January 26th at 12:00. You are welcome to bring friends or family who would like to practice English with us! Happy 2013! I hope you have all enjoyed the holidays with friends and family and may 2013 be the best year yet! This week, we recapped the holidays and in honor of being back to school, discussed routines and habits, both good and bad. And of course, we talked about how to make studying English a habit! So, on to the homework. What habit would you like to change in 2013? 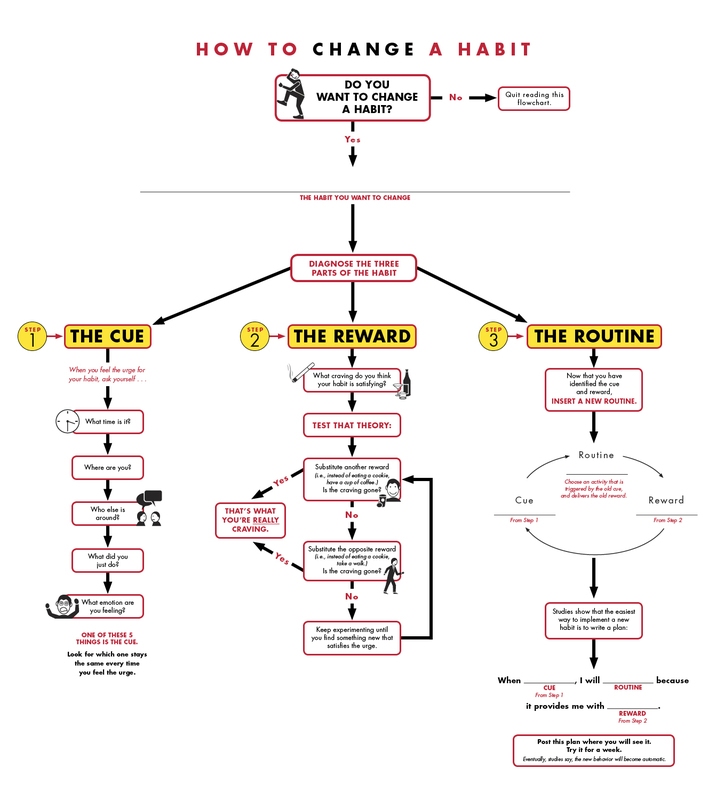 This week for reading, start with this infographic about How to Change a Habit. Or try reading about the Daily Routines of Famous Creative People. For writing, you could write a "Day in the Life" composition about your routines and your good and bad habits. Or make a plan about how you are going to make studying English a habit in 2013!